NIRDP was formally launched on Rare Disease day with much support from patients, families, health professionals and politicians. We were delighted that the NI Minister for Health, Social Services and Public Safety was able to participate in the event- cutting cake, presenting and, most importantly, spending time chatting informally to patients and families. Minister Poots gave up a lot of his time to support the work of the partnership, and we’re looking forward to ongoing work together. 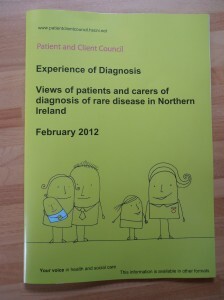 The Minister took the opportunity to launch the long awaited consultation on the UK Plan for Rare Disease. NIRDP will be working actively with RDUK to facilitate consultation within Northern Ireland. NIRDP is a group of interested families and professionals who donate or volunteer their time. Members have health conditions, caring responsibilities, jobs and family lives. The Partnership could not have developed as it has without the support of others. In particular the vision, leadership and very practical support of the Patient and Client Council. They developed a questionnaire, analysed the results and published a report on patient experience of diagnosis, and organised the very successful launch event. The development of NIRDP is itself a reflection of the method and principle ‘Stronger Together’. If you’re interested in supporting the work in any way, click on that ‘Join us’ button up there, and we’ll chat soon! Previous PostPrevious It’s Rare Disease Day — time for a launch or two!